Matt Damon has a top-secret role in Christopher Nolan's Interstellar! A former James Bond might be the top choice to play the new Alfred to Ben Affleck's Batman. Two young actors have supposedly read for roles in Star Wars: Episode VII. 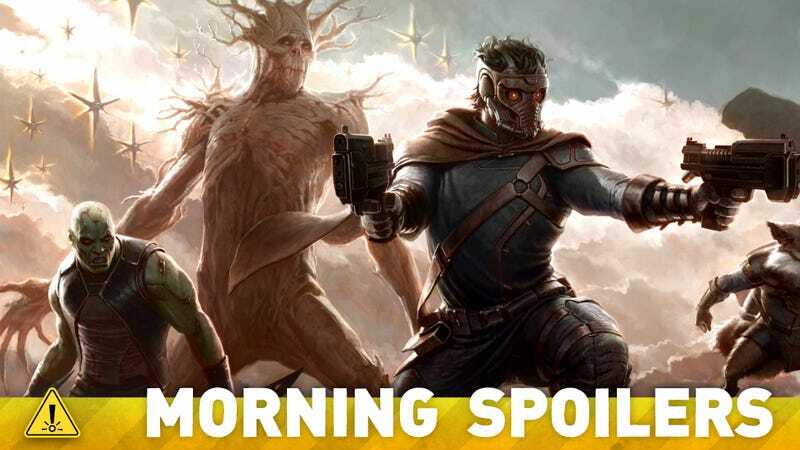 Vin Diesel offers some deep thoughts on Guardians of the Galaxy and Riddick. Spoilers on the way! I’d bust out the grains of salt for this one, but there are now two new actors rumored to be in the running for roles in the new Star Wars movie. The bigger of the two names is Alex Pettyfer –- who made a forgettable foray into sci-fi fare with the starring role of I Am Number Four but also did a decent job as a vapid stripper in Magic Mike, so I guess that’s something –- who has reportedly read for some unknown role, which theoretically could be Luke Skywalker’s son, but really could just as theoretically be a space- and time-displaced Winston Churchill, so it’s probably best to keep speculation to a minimum until we have anything more to go on. When we were doing The Chronicles of Riddick, back in 2003, David [Twohy] and I put together three leather binder, and each leather binder had a lock. They were those binders that you could lock. And we gave them to the head of the studio with one key. On the first binder, it said [COR] I, the second binder said [COR] II and the third binder said [COR] III. At that production level, the amount of money that we were spending at that point, we were thinking of going directly to the Underverse for [COR] II, and then to Furya for [COR] III. When years and years started to go by and we weren’t delivering the next chapter, we had to make a very conscious decision to find a way to tell the next chapter, continue the story and continue the mythology, even if it meant we weren’t going to get the size budget we had just had on The Chronicles of Riddick. Luckily for us, there was an outcry from social media to make this one rated R, which did two things. It ruled out all possibilities of a studio backing it. As you know, rated R movies are few and far between, nowadays. We’re all seeing less and less rated R movies, and less and less of them are being made. We had to take a more independent route, so I went to Europe, to a film market, and presented what this film was going to be, and got foreign money to start this movie and to be the bulk of the financing for the movie. And then, it was up to us to take that somewhat limited means, especially in comparison to where we were on Chronicles, and tell a story with those limited means. Thank god, the audience wanted it rated R because that justified, in some ways, taking a more independent route. First of all, David Bautista came in and was just great. I remember when he was auditioning, I immediately saw something. I immediately saw some potential… This was done a little bit differently [than with Dwayne “The Rock” Johnson in Fast Five] because we were still focusing on the Johns (Matt Nable) and Dahl (Katee Sackhoff) characters, and all the characters who are part of the mercs. But, I remember that day. I got spoiled on Fast Five. I started to get self-conscious about fight sequences because, invariably, the other person would get hurt, and you never want anyone to be hurt on a film, let alone you being responsible. The great thing about working with these guys who have spent their lives choreographing fights for wrestling is that that’s their specialty. Their specialty is selling taking hits. Their specialty is selling explosive hits without really making a contact, or really doing too much damage. So, I was able to exploit that for the Fast Five fight, as well as with David Bautista. He’s the only character in Riddick that our protagonist fights to that degree, in part because he was conditioned to do that. He was such a great choice to have that fight sequence with. “Liberty” – The Machine, now completely self-governed with its whereabouts unknown, resumes giving Finch its “irrelevant” numbers for people in danger, which include a U.S. naval officer in town for Fleet Week. However, with so many sailors flooding the streets of New York City, finding the officer in time presents an even bigger challenge for Reese and Shaw. Meanwhile, Carter has been demoted to a patrol officer as a result of her being set up by the corrupt police crime organization HR, and sets a plan in motion to eradicate them for good. Also, Root tests the boundaries of her new asylum surroundings, on the third season premiere of PERSON OF INTEREST, Tuesday, Sept. 24 (10:00 – 11:00 PM ET/PT) on the CBS Television Network.